At the first opportunity (March 13), Van Tilburg delivered a PowerPoint presentation with attendant discussion to CAMN (enclosed). The meeting as conducted including the announcement that the EISP project was in compliance with all requirements and CAMN approval was given by vote of acclimation. The discussion that followed focused on information exchange. They requested and Van Tilburg agreed to give an informal talk to CAMN that dealt with an historic overview of the project from its inception in 1981. They also asked for a more formal, multi-media presentation to be given to the community as a whole that also included an historical overview as well as the preliminary results of the excavation to date. It was decided that this would be done in November. They wish to communicate the time depth of the project and who in the community has participated in it. In the process of removal of the backdirt that had been returned to the pit last season in Squares 01-06, 22 and 23 up to 238-250cm deep, and in front of RR-001-156, we encountered two basalt pieces, both very small, that seem to be toki fragments. We also found one basalt flake at about the 2m level. One piece of obsidian, one piece of basalt and 2 pieces for worked basalt were retrieved from the backfill. Observations: The weather station continues to function without problems. The padlocks on the box are rusted and will need to be replaced. On the left side of RR-001-156 there is evidence on the surface of the rain run-off noted last season. The dirt line on the back of the statue is about 10cm above the current ground level. From behind RR-001-157 and dropping down at the shoulder level there is another 10cm drop in ground level. For the remainder of the day we made additional excavation screens, repaired existing screens, hired our excavation team. On March 14 we made our first site visit in order to repair the fence as needed, cut the grass, and begin reordering and removing backfill form squares 01-06. Continued removal of backfill at RR-001-156. The fill was removed to a wheelbarrow, visually examined and spot screened, and then deposited in the backfill pile. At 158cm at the SE corner of Square 06 we recovered a quantity of red pigment (kie’a. The pigment had been encountered last season but not collected. The pigment filled two level bags, including the soil matrix. In addition, a toki was embedded in the same wall at the same level. The pigment and the toki had been mapped in place last season but not removed. A sheet of plywood had erected against the wall to stabilize it. Materials collected were bagged and logged. In Square 03 at 160cm one piece of obsidian (worked) was collected, along with the stem and broken upper part of a mata’a. Square 03 at 173 one large fragment of a toki was collected. 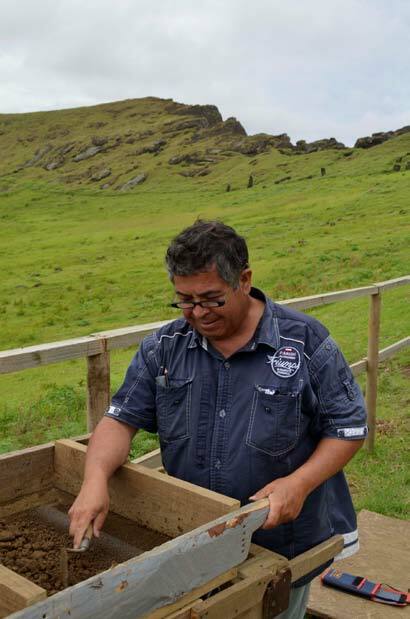 This day was largely occupied with meetings with CONAF and CAMN dealing with samples we wished to remove for analysis, as well as reports on the planned work at Te Pito Kura by J.M. Ramírez. We are still in the backfill levels at the front and right side of the statue. Square 22 had been opened last season but was not reopened this season. Square 23 yielded pumice, carbon, and mixed carbon and bone to the 238cm level. A small unexcavated bench against the east sidewall in Square 27 at 238cm was preliminarily sampled by Sarah Sherwood. 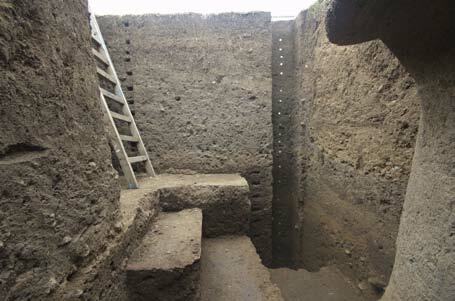 The ladder was placed in Square 24 throughout most of the excavation. No records of screened artifacts are on file from Square 24 to the level of 238cm. 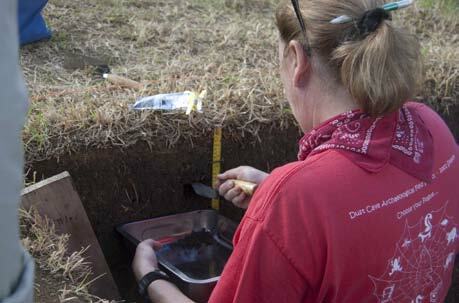 However, the soils were sampled in Square 24 along the entire length of the east sidewall to examine the stratigraphy. NOTE: A lack of recorded artifacts for Squares 24 and 27. An updated grid map was created to include newly excavated squares (see above). An interlude of confusion as to the numbering of Square 30 vs Square 06 during sampling was resolved with the column sample set in the SE corner area of Square 30 extending into Square 31. The column is sized at 20 x 50cm. Two types of samples were collected. The first was the heavy fraction, which came from the column excavation and consisted of nine bags. These materials were floated and materials or artifacts collected largely by Melisanda Pakarati under the supervision of Sonia Haoa. The second is the light fraction samples, which were collected separately and sent out for analysis (see Horrocks above). The turf was removed from the column excavation to about 10cm. A notation protocol was established for the light fraction samples using the Unit (statue), Square number, Column sample number, and Level. The entire column excavation was documented photographically and the samples cataloged. We continued the removal of backfill and in Square 05 first encountered and removed the plastic left in place last season to mark the floor of the excavation. The front of the statue was slightly damp, but so were the sides (where no plastic had been left in place). Therefore, there is no indication whatsoever of retained moisture in the vicinity of the statue. We began the excavation in Square 02 at 247cm with correlation of the overlap with the previous season being about 25cm due to the fact that the statue in the front very nearly covers all of Square 05. The overlap required a slight adjustment. 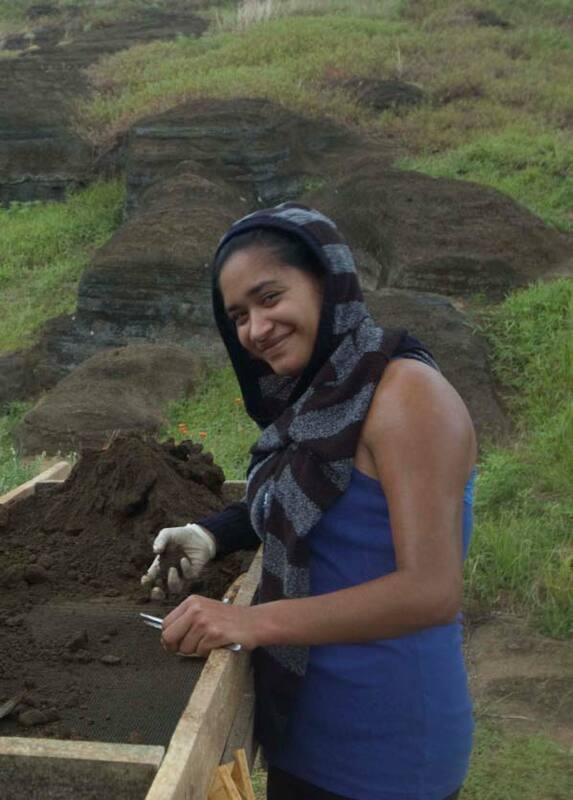 Pato began to dig out the heavy soil in Square 02 and Sarah continued the column excavation. We spent a good deal of time looking at the profile in search of the evidence of the Mana Expedition intrusion and the 1920 fire scar. There is a significant amount of disturbance and downwash on the column wall and at the back (south) wall, demonstrating a pulsing nature of short flows of water and soil. The colluvium on the top levels is largely yellow-brown, with bones of rat, possible avian or small sea mammal appearing in levels 10 and 11. Heavy presence of gravel was recorded in level 10, with bones and small fragments of toki also evident. Square 02 was excavated to 247-280cm. 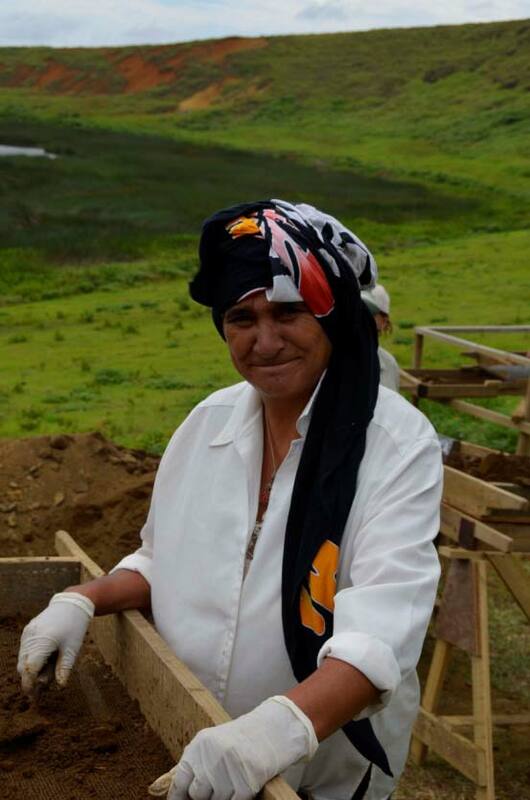 Pato continued excavating and is learning quickly how to do the job correctly and carefully. We began with Square 05 at 280m, where we found one large beach cobble (poro). The first two large fraction soil sample bags were removed. The poro removed from Square 05 yesterday at 280cm was documented. We begin excavating Square 30 at 328cm in order to facilitate the column excavation. We are seeking carbon from identified wood, including that from miru pupu, makohe, toromiro, and marikura. Square 23 is excavated with JMR supervising. Began Square 6 at 250cm and Square 2 at 247cm. Sarah Sherwood sampling stratigraphy in Square 24. Began Square 5 at 247 with Pato digging by hand at 280cm. 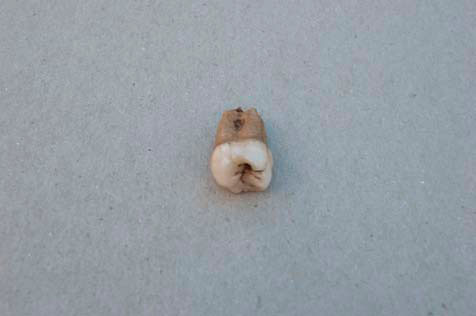 Materials found in screening include a human adult molar as well as numerous human, bird, and other animal bone fragments. Square 02 280-334cm and then reached papa at 380-420cm level. NOTE: One of the level bags has the level as 422cm. The papa reaches from Square 04 to Square02 and curves slightly. The statue thus appears to be standing in a hole excavated precisely for it but larger than required. The hole in which the statue in standing is up to 120cm deep. Photographed Square 02 with the plaque. 1/2 step is left in Square 03 and Square 06 at level. A step that was part of Square 03 was broken when Greg stepped into the pit carrying heavy photographic equipment. This was subsequently straightened and 3 buckets of dirt were screened and 1 level bag was collected from Square 03 at 334cm. 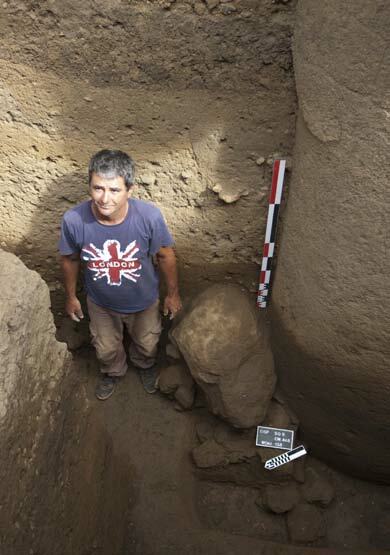 Pato began Square 02 at 368cm and at the same time we dug Square 05 at 371cm. This was required due to the configuration of the squares but is not comfortable for the recorders to have two separate squares screened at the same time. NOTE: The first (original) toki storage pit we created and mapped during the first phase excavations of 157 contained only objects collected from the dorsal side of 157. These objects were subsequently removed during pXRF work supervised by C. Fischer. They were photographed during the data collection process, but the numbering system established by JVT (who was not present during this work) was not kept. This was due, on part, to the loss of some of the blue tapes on which the individual numbers had been written. According to CAP, nearly all of the toki from this original pit were then reburied in the pit but a “few” of them were for reasons that are unclear were placed in Square 04 and then collected for storage in the second pit. Therefore, some of the toki removed today from the extension under Square 04 near the papa were among those that had been stored there and are neither documented nor counted in the inventory conducted today. CAP remembers storing them in the extension because he wanted to include selected pieces of them in illustrations of various toki styles. We began Square 06 at 368cm. A carbon lens was encountered that is a possible umu. The Square was closed at 420 (as above, a level of 422 is on one of the level bags). When plotting the total levels of the final levels summary diagram we give 420cm as more convenient for calculations. In Square 06 we note what appears to be a large beach cobble in form but the color of tuff. It is wedged against the statue and like the other boulders may be meant to hold the statue upright in place. The statue is not finished. The hands are not carved. The surface on the front of the statue is not smooth (see below for further description). The work this close to the statue if painstakingly slow. We screen Square 06 dirt from level 368-420 that was not finished yesterday and level the square at 420cm. Squares 02 and 05 in the front of the statue can no longer be kept separate as the statue is taking up almost the entire area of Square 05. 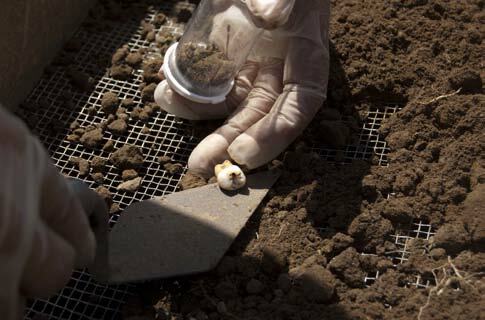 The dirt is combined for screening and annotated as such. Three level bags are collected. The combined squares are leveled at 4.42.5cm of compacted soil and large rock pavement. 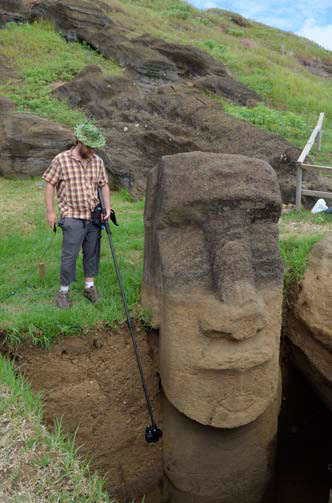 In Square 06, the apparent beach cobble is revealed to be a head (puoko) carved of Rano Raraku tuff. The head us upright and leaning against the right side of the statue. It is incomplete, appears broken. The left eye is complete. The right eye is incomplete and much smaller. The top of the head and the forehead are very well smoothed and finished. This is not a fortuitous carving but an incompletely executed one. From the surface to the floor on Square 06 on which the head is standing the measurement is 443cm. From the surface to the top of the head of the figure the measurement is 362cm. The head is thus roughly 81cm tall. It will be documented further in the next few days before backfilling. 1 toki in Square 04 (see above) at 330-369 is a variant that needs to be drawn. JVT trowels and removes by hand 1 large, shaped, rectangular block of coral (solid, said to the the “root” of the coral) from Square 04 at 330-350cm. It is 17.5 x 8 x 6cm and will be weighted in the lab. 1 smaller piece of coral was associated (8 x 6x 2cm) and a photo in situ was taken (F358). The same number was given for both pieces. Square 04 at 330-369 one elongated oval basalt cobble with drilled holes on two sides. The upper side has a random arrangement of thee holes, while the lower side has a circular pattern of them. The basalt piece weighs 302g. According to CAP, it is a “haka pu pu” or a stone on which the holes in shells are drilled. He remembers seeing a stone used in this way as a child. The object is 12cm long and 6.5c wide. There is slight wear and it is broken on one side at the tip. The holes are 1-2cm apart. Document boulder head. Square 01 at 330-412cm yields a shark took at 330cm. April 4 Square 04 369-476 level and Square 06 448cm level. The left hand space of the statue is fully revealed and the hand is not carved. The surface is plane. The hand is roughed out on top. Photographed. April 6-8 JVT and CAP on site all day documenting stratigraphy and the statue head, along with the floor of the excavation. JVT photographing head for Greg’s 3D reconstruction. April 9-11 CAP and Pato closing site. JVT and JMR with collections inventory and photography and in meetings regarding samples. JMR departs. Material depth range for Season 2, Phase 2 is 0 to 462cm with basalt being the most frequently collected, followed by obsidian. 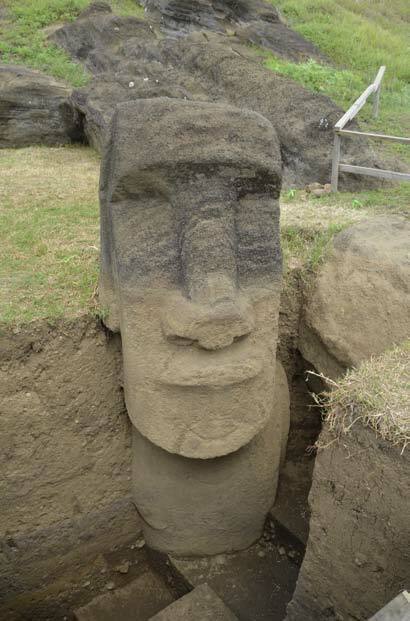 In contrast to other seasons for both statues, this excavation contains far more incomplete or broken toki (86 percent of the total). April 12 JVT site check. Site completely closed.